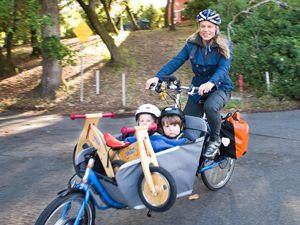 On her quest for a deeper connection in an increasingly isolated and digital world, local Marin director Liz Canning found her freedom in cargo bikes. She crowdsourced her documentary Motherload to share this experience, exploring the origins of the bicycle, its surprising social impact, its rise to popularity, and how it began to fade with the advent of cars. With indisputable joy, Canning approaches her newfound passion as a former competitive cyclist, a feminist, and a mother, stressing how empowering becoming a part of the global movement to replace cars with bikes can be. The result is a fascinating and personal look at sustainability, consumption, and how something as simple as a bike can be used to reshape the concept of transportation and freedom. Please note: the screening time for the 5/4 screening was changed to 5:45 pm after the program guide went to print. Liz Canning’s work has screened internationally, winning awards including a Sundance Special Jury Prize (American Blackout). After graduating from Brown University in Semiotics, Canning worked at San Francisco’s Artists Television Access and Film Arts Foundation while making films. Her award-winning Handmirror/Brushset Included screened internationally, on PBS, and at the Museum of Modern Art in NYC. Since 2000, Canning has worked as a professional filmmaker focused on editing and animation for documentaries. Girls Rock! secured theatrical distribution and featured five animated sequences created by Canning and to demonstrate the cultural forces affecting young girls.